Netflix has begun testing its cheapest plan in India right now. The video streaming service has started showing new weekly plans to select users in India. There are four pricing tiers for weekly plans — Rs. 65 per week for the mobile-only plan, Rs. 125 per week for the Basic plan (SD only), Rs. 165 per week for the Standard plan (two devices, HD), and Rs. 200 per week for the Ultra plan (four devices, 4K). 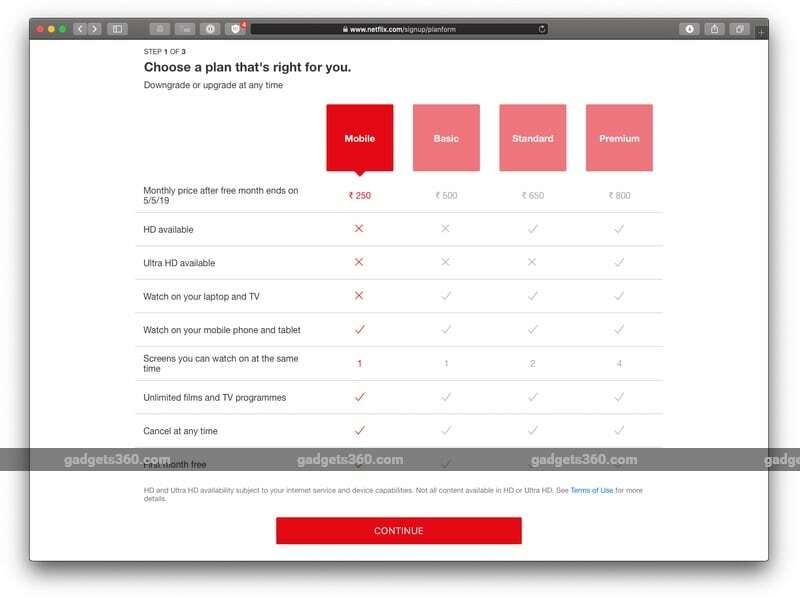 Gadgets 360 also spotted a new monthly plan on Netflix India — Rs. 250 per month for mobile-only access, which Netflix said is also being tested in India. The mobile-only plan on Netflix offers access to only one screen at a time, which has to be a smartphone or a tablet. You don’t get access to HD or 4K, and you obviously can’t watch this content on laptops or other devices. Netflix had confirmed to Gadgets 360 that it has been testing a mobile-only subscription plan in India at Rs. 250 per month (seen below). The weekly plans weren’t spotted until today. Most weekly Netflix plans are priced around the same as their monthly counterparts. However, this does offer people the flexibility to watch TV shows and films at a lower price. For instance, if you were interested in watching a new season of a show such as Stranger Things. You could hop on to Netflix via a weekly plan, watch the show within a week, and cancel the subscription — while paying between Rs. 65 and Rs. 200 as opposed to the full monthly fee. However, Netflix is one of the most expensive streaming services in India. While the weekly pricing lowers the entry barrier, the streaming service faces stiff competition from Amazon Prime Video and Hotstar, both of which offer cheaper plans. Hotstar has a free tier, a VIP subscription at Rs. 365 per year, and a premium plan at Rs. 999 per year. Amazon Prime Video costs Rs. 999 per year, but you also get access to fast shipping via Amazon Prime, a music streaming service in Amazon Prime Music, among other benefits.